!!! (Chk Chk Chk) - Is that a yes or a no??? Dance punk/indie rock band from Sacramento, California with a name that, as far as our experience goes, is one of the most difficult to Google of all band names. Typing chk chk chk tends to help, because the url of !! !’s website is www.chkchkchk.net. And that gave the band an idea. 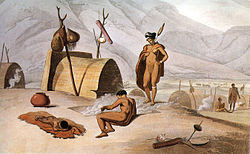 By the way, the click sounds the Khoisan make in the film are mostly very different from each other. For this reason it can not be so that '!' is the same as 'chk': the sign can represent any monosyllabic sound. So !!! can mean no no no, but it can also mean yes yes yes.